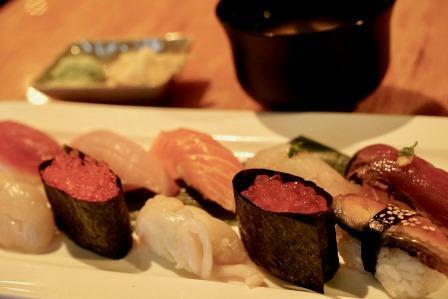 The Japanese cuisine boom in San Francisco has been more and more diversified every year, and the number of restaurants which are run by non-Japanese owners is increasing. In the Bay area, Michelin-starred Japanese and non-Japanese restaurant owners share a 50/50 ratio. Highquality and unique Japanese restaurants are spreading to the suburbs, and people are talking about them everywhere. I heard about such a restaurant existing in Fairfax, a small suburban town of San Francisco, which is run by a couple of American co-owners. I decided to go there to make a report. This little town possesses some local power. The “Good Earth” (a sustainable super market) born in Fairfax has experienced rapid growth supported by its local residents. There are many small individual stores in the town center, and those markets, cafes, and restaurants lined up on the streets are creating a warm and relaxed scenery. On one such street, I saw people gathering around. It was a line of people waiting for the opening of the only Japanese restaurant in town, “Village Sake”. I asked them how they felt about the restaurant. The customers in the line, who made up a wide variety of age groups commended on the restaurant, in a way that reflected how much the restaurant was loved by the local people. The place of topic is the first restaurant run by Scott Whitman and Scott Porter. 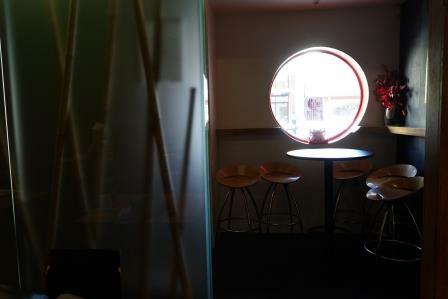 It is an Izakaya-style restaurant which is high-end, yet casual. Chef Whitman worked for “Fog City Diner”, a long-established San Franciscan American cuisine restaurant chain in Osaka for 15 years as a staff member since its opening in Osaka in the nineties. While working there, he fell deeply for the charms of Japanese cuisine, and after returning to the US, he worked for “Sushi Ran”, a highend Japanese restaurant, as a chef, and earned a good reputation for his great skills. In the meantime, ideas for new recipes and a concept for his own place started to grow in his head. In 2015, they opened “Village Sake” in Fairfax, where both of them were born and raised. Mr. Porter, who named the place as a village, expressed his love for the region as follows, “Doesn’t this name sound cool? I imagined a place where local folks gather to mingle by eating and drinking.” Surprisingly, Mr. Porter also has an active career as a fire fighter. I asked him why he tried for an unfamiliar field, which was to run a restaurant. He answered, “I like to eat. You live only once, so I wanted to try different things.” He was born and raised in the same town as Mr. Whitman, and they were not only friends, but roommates as well. 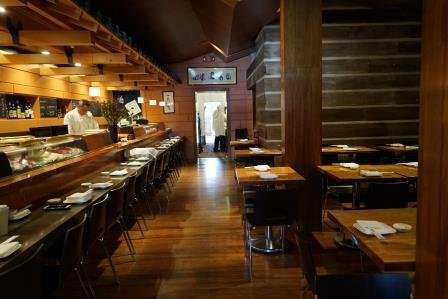 The restaurant’s casual looking interior space that contains grainy wooden tables which give a feel of warmth of wood with effective warm illuminations, provides a cozy Izakaya atmosphere. Japanese-style partitions are installed to help maintain your privacy and comfort. Their efficient looking staff members are all friendly, and look like they are having a good time. The cheerfulness of the two owners seems to have a lot to do with the way the restaurant is operated. The menu is full of Mr. Whitman’s creative dishes. The special of the day of my visit was the “Seater Albacore” ($11). The taste was deepened with fresh basil and curry oil, accentuated by lemongrass and small goat cheese cubes. The recommended dish, “Seared Toro” ($24) was tender and had a melting texture of seared medium toro, and the caviar topping was quite unconventional. Its rich taste and citrus sourness created a good balance. 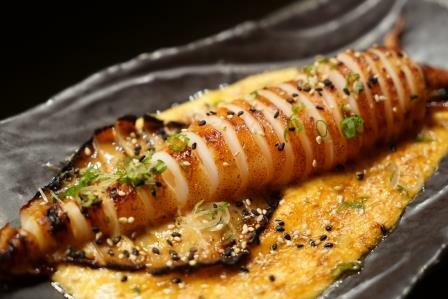 “Kansai ika” ($11) is Whitman’s own favorite dish of the Osaka area, in which locally-caught fresh tender squid is served with chill aioli sauce. Among others, Osaka specialties, takoyaki and okonomiyaki are popular as well. They also serve traditional dishes such as pork belly, and sunomono, which have been arranged slightly to suit American tastes. 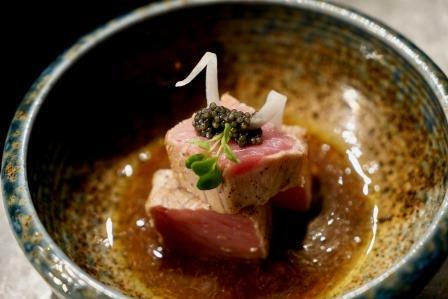 They serve everything from light dishes such as Asian kimchee brussel sprouts and dumplings, to high-end items in which lobster and caviar are used in addit to tara saikyo-zuke (miso marinated cod), and wagyu beef tataki, and all of these dishes create a true Americaunique Izakaya menu. This is the kind of restaurant you want to go every day because of their reasonable pricing for a high-end quality food San Franciscan restaurant. 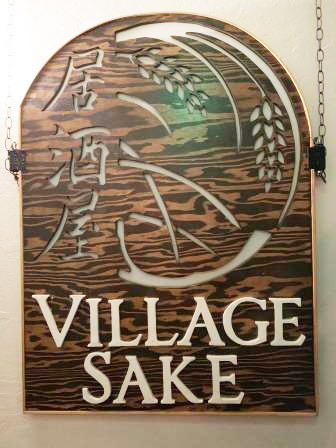 To match their concept as “a place to enjoy sake and food”, the drink menu of “Village Sake” consists of a wide variety of local sake, plus shochu, beer, and wine brands. They also carry specially aged sake and barreled sake, which are very well appreciated by sake connoisseurs. Since its opening, this place has been featured in local magazines as one of the best 100 restaurants in the area, and has even earned the “Michelin Guide’s Bib Award”, etc., and has been on the right track ever since. They are planning to open a new sake bar next to the restaurant soon. “Village Sake” is now on the way to proceed to the next stage supported by the residents in the area. 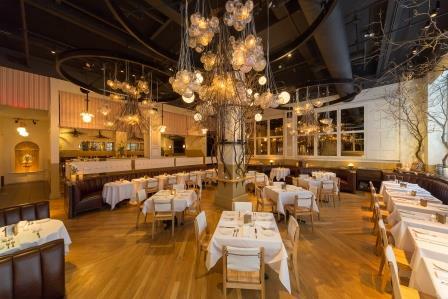 Park Avenue” is a restaurant which has the theme, changes of four seasons. At every change of the season from autumn, winter, spring, to summer, its menu, its interior decorations, and even its staff uniforms get renewed, and the name of the restaurant also changes to “Park Avenue Autumn”, “Park Avenue Winter”, “Park Avenue Spring”, or “Park Avenue Summer”, and the sign gets changed accordingly. 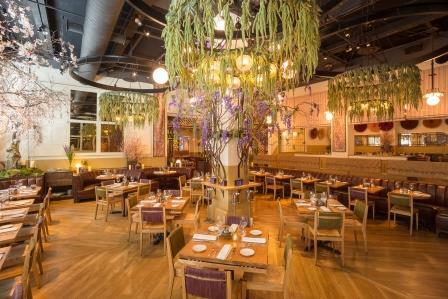 This innovative idea of renewing the entire restaurant according to the image of the current season frequently became the topic of conversation, which led this place to win numerous awards in the past. 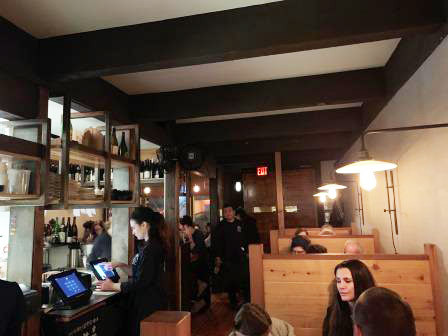 This restaurant has been loved by New Yorkers for a long time. It was operated for 22 years on the Upper East Side since its 1992 opening before it moved to the present location about 5 years ago. The concept for the menu is contemporary American. 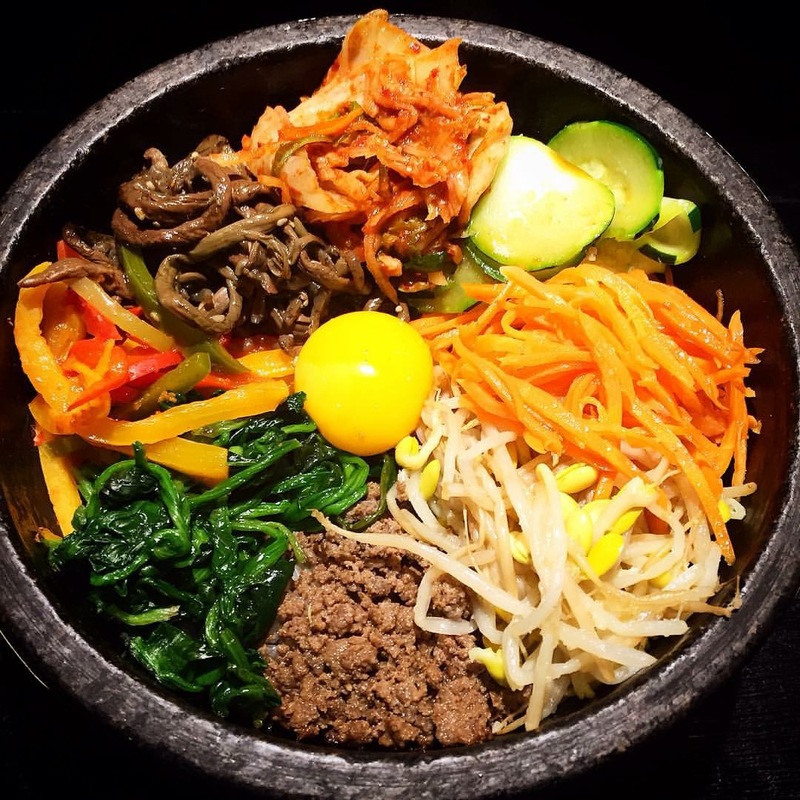 Ingredients from all over the world are creatively arranged in the dishes. 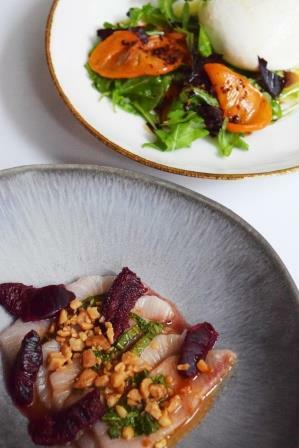 The person who created the basic principles of the menu is Craig Koketsu, the former executive chef, who has now the role of both chef and partner. He is a third-generation Japanese American, and his last name, Koketsu, is Japanese. It may be the reason why he uses so many Japanunique food ingredients in his dishes. 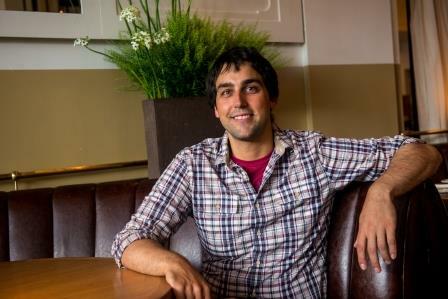 The present executive chef is Zene Flinn. was born and raised in the Quincy District of Washington State where agriculture is the main industry. His father was an apple grower there. He grew up surrounded by seasonal fresh ingredients, which inspired him naturally to seek a career in cooking. After graduating from the well-known culinary school, “French Culinary Institute (presently called International Culinary Center)”, he built up his career at “Nougatine” run by Jean-Georges, who is a top leading French chef in New York. He joined the “Quality Branded Group” which developed 10 restaurants in New York, Miami, and Denver including this “Park Avenue” in 2010. 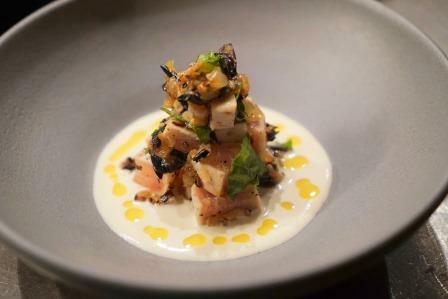 Flinn’s dishes represent his full love for the ingredients, and are superbly creative. He uses a wide variety of Japanese ingredients that include miso, mirin, yuzu juice, yuzu kosho, shirodashi, wasabi, sansho, umeboshi, etc. Soy sauce and miso are often used as a secret seasoning to enhance, deepen, or soften the taste. Yuzu, red pepper, and sansho are used to accentuate dishes by contributing to the impression for the first bite, or for visual effects. The surprising combinations of ingredients are something only a non-Japanese could think of, and are excellently balanced. Their concept, in which the changes of each of the four seasons is valued, is somewhat common to what Japanese cuisine is. In the summer of 2018, Flinn was invited by the Niigata Prefecture Government, and visited its local farms and producers, and was deeply impressed by the Japanese food ingredients, and learned a lot about them. Just recently, in January of this year, he impressed industry people at a reception held by the Governor of Niigata by creating and serving brand-new dishes, in which he used Niigata-made soy sauce, Kanzuri (fermented red pepper seasoning), and miso in Italian, Mexican, and Spanish style dishes. One of the charms of this restaurant is its size. There are 220 seats in the main dining space alone. Additionally, there are 4 private spaces for event use, on which they like to put a special value. All those 4 spaces combined can accommodate parties of 200 people if sitting, and 300 if standing. In the eventful holiday season, they sometimes have as many as 1000 people a day. 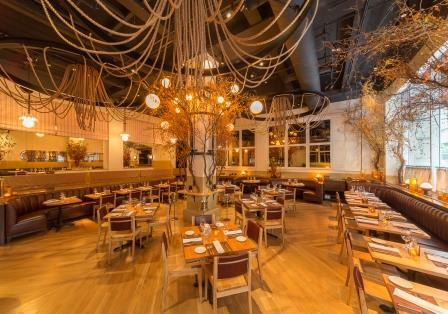 This is definitely the kind of restaurant you would like to visit at every season - Autumn, Winter, Spring, or Summer - to enjoy each season of New York through all 5 of your senses. A Japanese style yakiniku restaurant “Oreno Yakiniku” is located on the third floor of the Weller Court, a shopping mall in Little Tokyo. This place gets especially busy during lunch hours and also while some event is being held nearby. During lunch hours, neighboring Government office workers and other business people swarm to this restaurant to get the lunch specials of this restaurant. Whenever some Japan-themed event is held in the downtown area, such as the Anime Expo, a huge number of people would move into Little Tokyo from the event hall. This restaurant shows different faces between lunch and dinner. First of all, the reason for the popularity of lunch time is the richness of their menu, and the reasonable pricing. As for the lunch menu variety, aside from the Yakiniku lunch, they also offer as many as nearly 30 or so different items. The grilled miso-marinated black cod, fried salmon, fried prawn, kurobuta shoga-yaki, tonkatsu, jidori karaage, curry, and donburis are some of those items, and most of them are under $15. The ishiyaki bibimbpa is only $9.95. The pricing is very reasonable considering its good location. For dinner time, on the other hand, a yakiniku set menu called “Snake River Farms Kiwami”, in which a high-quality brand beef is used, is very popular. 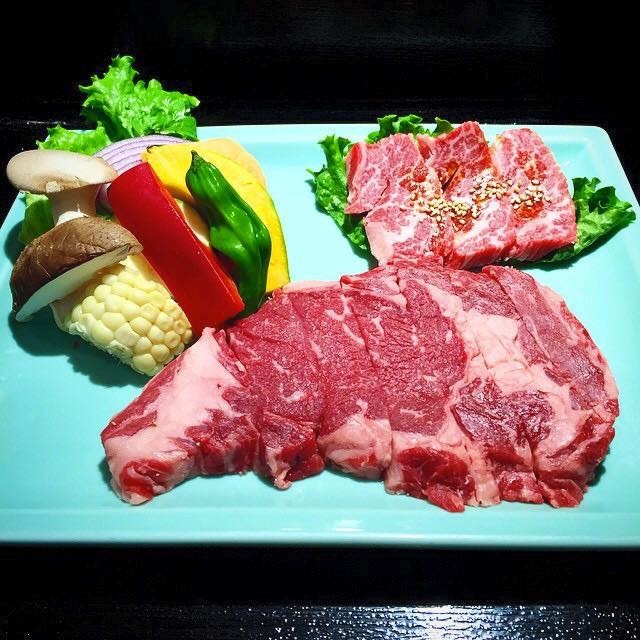 The Snake River Farms Kiwami is the highest-quality USDA certified beef, and is a relative of Kuroge Japanese beef. “The beef we use is equal or above prime grade. You can enjoy true high-class delicious beef, which tastes different from all-you-can-eat type of beef,” says the Assistant Manager, Sachie Ebata. 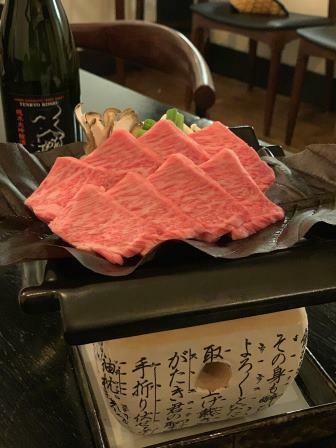 The most popular item among their yakiniku set menu items is the KOBE SPECIAL. As the name suggests, all the meats in the set, yukke, tongue, ribeye, short rib, outside skirt, chuck flap, and ox tail soup are Kobe beef. In addition, the set includes an ishiyaki bibimpa, a cabbage salad, and a dessert. This special course, which is satisfactorily enjoyable with its generous volume and variety, is $135. The reason for having continuous repeating customers seems to be due to not only the meat quality, but also the variety of meat parts you can taste. Thus mentioned, the average lunch time spending for a single customer is between 10 and 15 dollars, whereas it is between 30 and 50 dollars for dinner time, which is a big difference. In order to attract more customers for dinner hours, this restaurant takes on an attractive strategy, which is to offer happy hour twice a day. 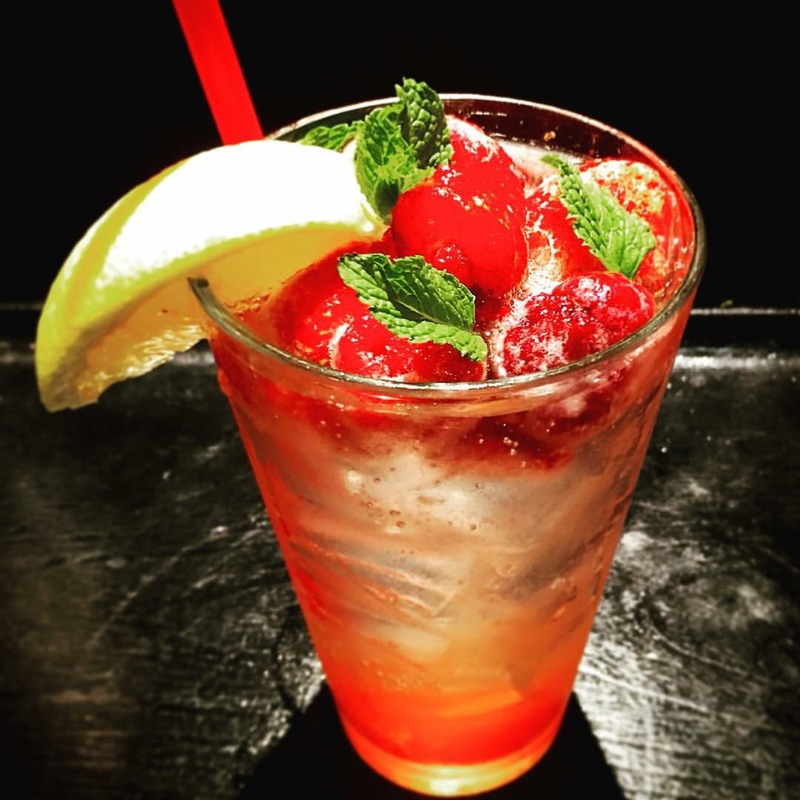 The first happy hour is from the opening time (different depending on the day: either 5pm or 5:30pm) to 7pm, during which they offer a drastic discount for Asahi draft beer at $1.99 (instead of the regular price at $5.50), $1 off on cold or hot sake, and $2 off on a glass of wine. 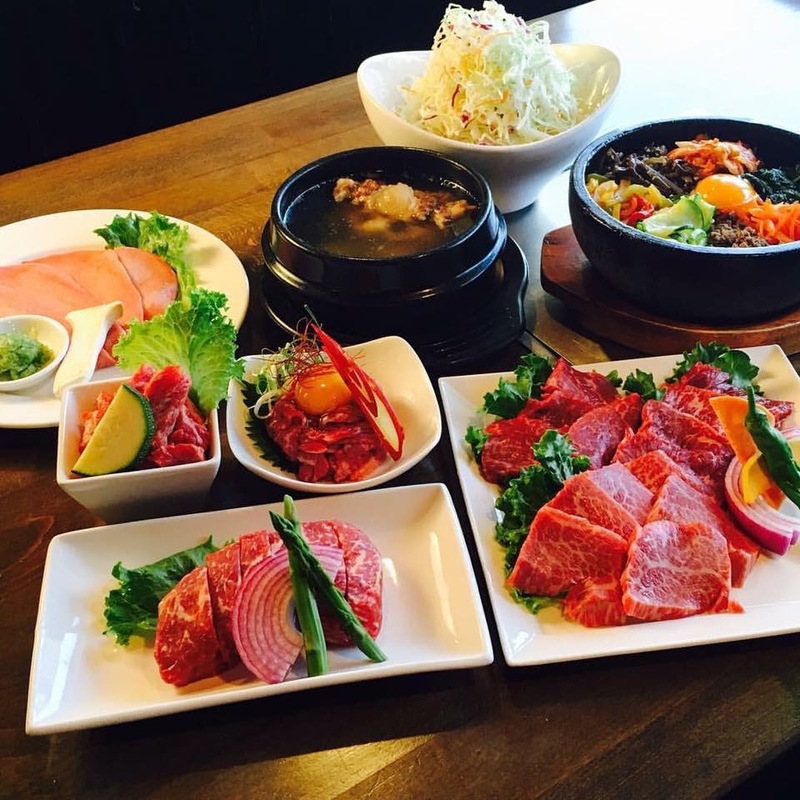 Moreover, they offer a 20% discount on a bottle of shochu, and 15% off on a portion of the meat menu items. The second happy hour is between 8 and 9pm. The discount rates on the hot sake, cold sake, and a glass of wine are the same as the first happy hour; however, Sapporo draft beer is offered surprisingly at only 99 cents. But, there is a catch. This special discount applies only to the customer who ordered more than $10 worth of food or drinks for one person. Before this restaurant opened 6 years ago, the Assistant Manager, Ebata, was working for EBISU, another Japanese restaurant in Little Tokyo. Both Oreno Yakiniku and EBISU are under the same company, Bishamon Group, which has developed more than 10 restaurants in the Los Angeles area. 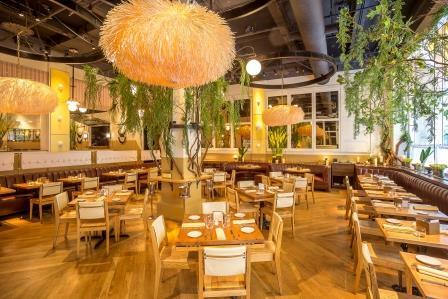 The Bishamon Group is the pioneer which has brought back the vividness to Little Tokyo ever since its opening of the popular Daikokuya ramen restaurant on 1st street, which has been attracting a lot of customers of many ethnicities. Due to the construction rush of the nearby condominiums, the area has a problem which is the lack of parking places, and the parking charge hike, which is also affecting their ability to attract more customers. Despite the odds, they say that Oreno Yakiniku is committed to keep offering quality meat, and continuing the business based in Little Tokyo for the future. A traditional Japanese ceremony of breaking open the sake barrel was held on stage, followed by the welcome beverage of “Awa sake” served in champagne glasses to approximately 300 Japanese and Italian guests to toast together at once. This sight had me dreaming of “Awa sake,” instead of champagne, being served at a large government-sponsored party, such as the 2020 Tokyo Olympics. In Italy, where sparkling wine originated, I observed the Italian staff showed no sign of hesitation serving Awa sake at an official party sponsored by Japan. There’s no reason why we can’t do the same in Japan. Not to deny champagne in anyway, but the conventional welcome beverage at past parties was the bubbly alcoholic beverage champagne, without question. At the same time, there is no reason why champagne should be the only beverage choice for foreign dignitaries to give a toast at the Tokyo Olympics. Although “the only beverage option for a toast” in the past was champagne, we now have “Awa sake” as another option, served successfully at a party in Italy to all attendees for a toast without causing any confusion in the operation. 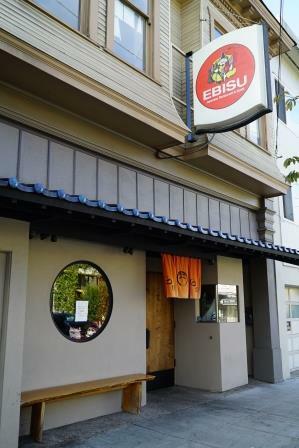 Ebisu, which is going into their 37th year of operation this year, is a long-established restaurant that has been leading the sushi boom in San Francisco. 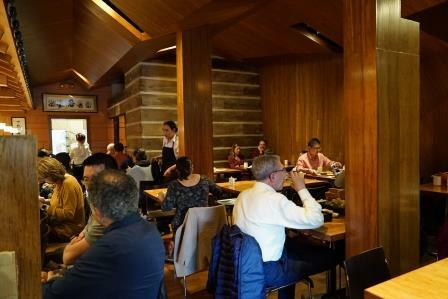 This restaurant is located near the center of the Golden Gate Park, and had become a super popular place in the nineties, where people would wait in line for a long time. Since then, they have tried diversified management styles, and tried out new sushi business models. Actually, in the past 30 years, they have expanded the business by opening 3 new restaurants, then closing them, and currently running only the main location. In their history, you can identify the pros and cons of a family-run operation. Ebisu has always been particular about quality and originality, and therefore, it was their management strategy to match the trends of the time. “The fundamentals are the most important things for the operation, which are consistent procurement of fresh ingredients, and the management,” says Erick, the 2nd generation owner. In 1999, Ebisu Family’s second location, “Hotei,” opened. It was a noodle specialty restaurant which no one paid attention to at that time. The secret dashi made at the main location across the street was used for the noodle soups, and their wide variety of menu items that included udon, soba, somen, showa-taste ramen, etc., and its casual atmosphere made this place a hit. 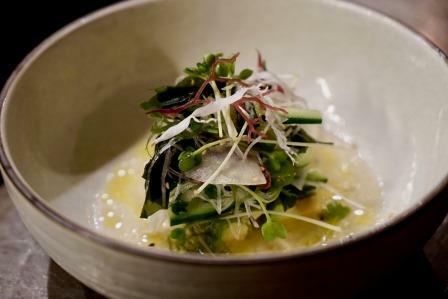 “As long as the base for Japanese cuisine is solidly mastered, you can create any dish,” at that time said Steve who is the founder, and currently the chairman. Especially, the “Reimen (cold noodle)” with house-made rich sauce, which you could not get anywhere else, was their top menu item. Ususally, average time people spend at a noodle specialty restaurant is not long, and therefore, its rotation is quick. From the customers’ point of view, it was really convenient that the restaurant was open from lunch through dinner time, and it was nice that they could have Ebisu’s roll sushi at a reasonable price. This location, thus quickly became very popular. Some customers who could not get into “Ebisu” went there, too. However, due to the ramen boom that came later, those customers slowly left for wanting of the new thing, ramen. For the 2 years prior to closing “Hotei”, they tried to continue by changing the owner, but finally closed its doors in 2015. In the 2000s, the core business that they were running along with the restaurant business was catering of sushi for parties, and catering for business offices. With catering for weddings to business meetings at renowned hotels, they were extremely busy. The catering business was rapidly growing around that time as a new food business model. Erick, who was the leader of their catering business said, “It was really crazy, the situation we were in”, as he reminisced about those days when he was rushing around like crazy with his father and brothers. Presently, they are developing a well-balanced business based on the main location as the core. In the early 2000s, the “Ebisu” family opened a branch at the new international terminal of SFO (San Francisco airport) which is known as “the most gourmet airport”. Ebisu was really standing out amongst the selection of restaurants and stores there, where the food culture unique to Northern California with the highest Asian population was symbolized in. Furthermore, the second “Hotei” opened in the Finance District, and their business was at its peak. On the other hand, in the background of such successes, they were having constant hardships with administering of employees, and the management. The distance from the main restaurant seemed to be one of the reasons. The idea of Steve’s, “to keep everybody within the reach of his supervision”, was far from the reality. It was also the time when maintaining of human resources was not catching up with the demands of the rapidly growing Japanese food businesses. In the second half of the 2000s, San Francisco went into the IT bubbling period, and high-end Japanese restaurants were appearing one after another. 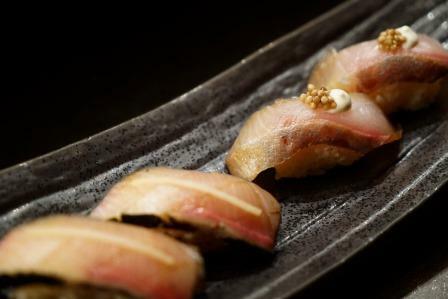 Fine dining restaurants that served Omakase and Kaiseki courses increased in number in a very short time. Ebisu did a renovation of the entire restaurant in 2008, but did not change their position all throughout the past 30 years as a casual, locally based restaurant. Because of it, they still keep long-time regular customers without getting distracted by new trends. Moreover, due to the renovation, the older image of them, which is a usual typical sushi restaurant of the nineties, has transformed to a modern, bright, and spacious kind, which is drawing new types of customers. Adding more counter seats is contributing to the increase in the number of single customers. The long-lasting Ebisu, which was established by a single generation, has been going forward by changing their business format along the way with the times. What has not changed is their offering of fresh ingredients, and their support of the local regular customers. Their family operation principle in which they do not rely completely on strangers, has been carried over to the second generation, and is still evolving. In this issue, I’d like to pass on to our readers a trick that enhances one’s abilities to pair sake with food. First, please select three brands of sake with very different properties. The differences in properties are hard to tell without drinking the sake, but first, let’s select the sake according to the information listed on each label. 특히 술과 음식 페어링에 대해 많은 사람들이 "뭐 그렇게까지, 별로 관계 없다"고 생각하고 있지는 않을까요? 이번에는 약간의 노력으로 일본주와 요리의 페어링 능력을 높일 수 있는 비결을 알려주고 싶습니다. 우선 최대한 성질이 다른 일본주 3종류를 준비하십시오. 성질의 차이는 실제로 마셔봐야 알 수 있는 것이지만, 일단 라벨에서 확인할 수 있는 정보로 선택해 봅니다. 예를 들어, 쥰마이 다이긴죠, 특별 쥰마이, 쥰마이 키모토처럼 산지가 전혀 다른 것을 찾아 봅니다(아키타, 니가타, 효고 등). 미국에서 만든 일본주도 가격이 저렴하니 이것도 함께 비교해 본다면 재미있을 것입니다. 3종류의 술은 반드시 같은 모양의 유리컵에 담으십시오. 이때 냉장고에 3시간 정도 보관해서 55°F 정도가 되도록 합니다(화이트 와인잔이 더 좋습니다). 그리고 요리는 일본 음식뿐만 아니라 중식, 이탈리아 음식 등 (너무 맵거나 마늘맛이 강한 것은 피합니다. )과 함께 시도해보는 것도 재미있습니다. 주의할 점은 일본주를 마셨을 때 음식과의 조화, 맛의 변화, 그 음식 특유의 향의 변화 뒷맛입니다. 이러한 느낌이 기분이 좋게 느껴진다면 페어링은 "좋다"고 볼 수 있습니다. Characteristics of New York City are strongly reflected upon old brick buildings and graffiti on the walls of the Lower East Side. In this town, new hotels, galleries, restaurants, and bars have been appearing one after another in the past few years, and the scene of the town has been rapidly changing. One of them is “Kaikagetsu NYC” that has the Hida-region of Gifu prefecture as their theme, with a brand-new concept. When you step into the restaurant, being enchanted and led by the elegant swaying paper lanterns hung in the front, its beautiful interior catches your eyes first. You see lamps standing in line like on a street in the space where deep charcoal brown grainy woods, white walls and ceilings are effectively laid out. As you keep walking forward towards the heavy door in the back, you feel like you are walking down the street of the Hida region where old houses stand in line along the streets. A truly relaxing and elegant ambience has been produced there with impressively presented Mino Washi paper and local artifacts, etc. The dishes served there are dominated by the Hida-region’s local cuisine. Hida beef, a Gifu prefecture specialty, is featured as the main menu item, and they serve a wide variety of both traditional dishes such as “Hida Beef Hoba Yaki” ($60) and “Hida Beef Toban Yaki” ($60), and modern version dishes such as “Hida Beef Curry” ($24) and “Hida Beef Skewers” ($24). The “Hida Beef Nigiri Sushi Sampler” ($35), which is sushi of lightly char-boiled Hida beef, is particularly well received. 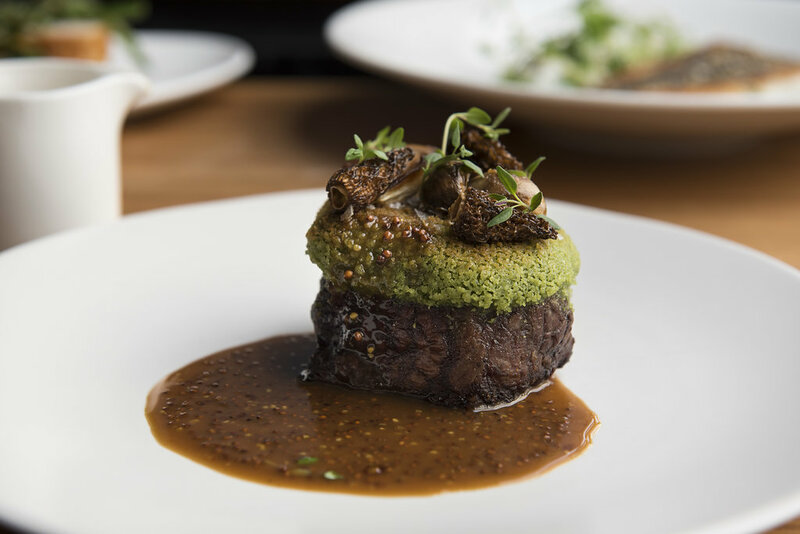 Variations of possibilities of wagyu beef are exhibited one after another, which surprises and impresses you. As for Japanese sake, it is extremely carefully selected mainly amongst the Hida-region brands. 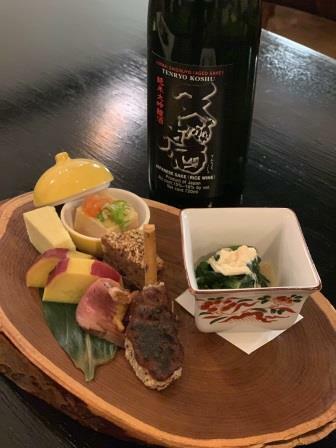 “Tenryou Koshu” Junmai Daiginjo, which has a distinctive aroma, is especially popular, and many customers order it for pairing with Hida beef dishes. 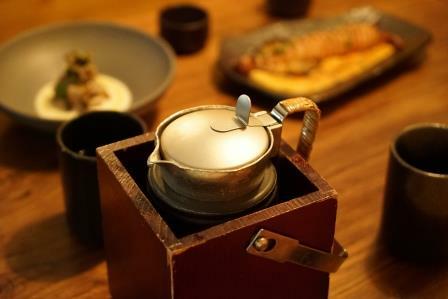 There, you can either choose to sit at a table to relax to enjoy a Kaiseki course, or sit at the bar to enjoy sake while having à la carte dishes. “Their unprecedented unique concept, Hida, and the ingredient, Hida beef, which is very attractive to Americans, must be appealing to New Yorkers,” says Tomoyuki Iwanami, the owner. Mr. Iwanami was born and raised in New York. He has a unique background. He worked in both the music and fashion industries. He was specialized in marketing and branding. The joint effort with Mr. Yasuo Shigeta, CEO, Forrest Fooding, Inc., also his friend of 10 years, who runs 37 various types of restaurants in Japan, started extensive market research about 5 years ago for the main purpose of opening a Japanese fine dining restaurant in New York, which is the center of the world of eatery. What they took most of their time was to look for the location and building. They had their eyes on the Lower East Side since the beginning; however, they felt a special energy and growth potential of this area by seeing the past year’s remarkable changes there, and eventually decided to choose this location. I found out that they had decided on the theme as the Hida region later on. They first determined the condition of the existing real estate candidates, local clientele and their characteristics, etc., and then chose “Kaikagetsu” as their themed restaurant among the running business models of Forrest Fooding Inc. The strong selling point of “Kaikagetsu NYC” is, no need to say, its particularity about ingredients and cooking style. They brought as many as 3 chefs from Japan, who are experienced and well established in Kaiseki cuisine. Their truly authentic and delicately crafted dishes are very well recognized. The colorful presentation of each dish that makes you feel the present season, looks like a piece of art. Playful arrangements are applied to daily changing ingredients by the chefs, and never bore even the repeating customers. Such strengths of theirs was taken into their branding strategy, and used for choosing the media that are particular about foods and drink, for their advertisements. They also invited concierges of nearby hotels to introduce their concept and dishes so they can recommend the restaurant to the hotel guests. Diligent efforts such as those worked out, and the restaurant has become a place where gourmet customers who want to eat good food, gather despite the location which, you cannot say, is really convenient to reach. “As a Japanese who was born and raised in New York, I wanted to do something for Japan,” continues Mr. Iwanami. Aside from running the restaurant, he is contributing to the exchange of Japan/US food cultures by hiring novice chefs who are interested in Japanese cuisine, and training them, etc. I’d really like you to visit this restaurant where you can fully enjoy good old Japanese elegant ambience and local cuisine. 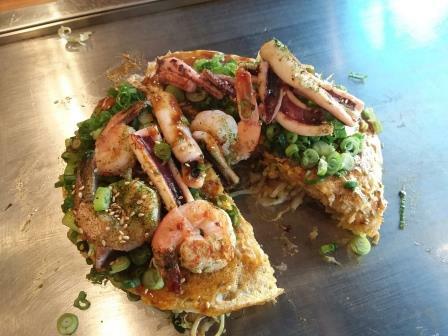 Taste Hiroshima-style Okonomiyaki in the US! 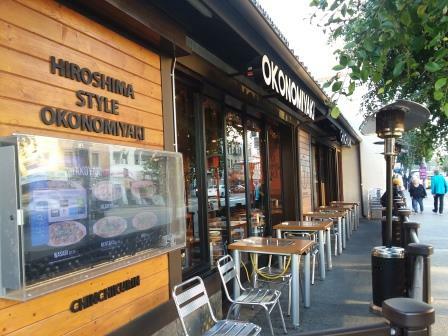 Okonomiyaki restaurant, Chinchikurin, stands in front of the Yagura of Japanese Village, the symbol of Little Tokyo. Teppan-yaki tables are laid out in an orderly way in a large space, and their kitchen is an open style. If you get seated at the counter, you can watch Okonomiyaki being made by chefs in front of you. “Hiroshima-style Okonomiyaki is difficult to make because it requires one to make many layers, therefore, although a teppan is installed for each table, we don’t ask customers to cook at the table. Instead, we deliver Okonomiyaki cooked by a chef in the kitchen to the teppan, so the customer can eat while it is still hot,” explains Tsuyoshi Sahara, the manager. Mr. Sahara is from Hiroshima. His family had a teppan at home when he was little, and it was his father, who didn’t usually cook, who took the responsibility whenever Okonomiyaki was chosen for dinner. The Chinchikurin chain was founded in 1999 in Hiroshima which Mr. Sahara is also from. The chain has developed 10 locations in Hiroshima, and 3 locations in Tokyo as restaurants which offer various izakaya style menus that contain mainly Okonomiyaki and Teppanyaki items. 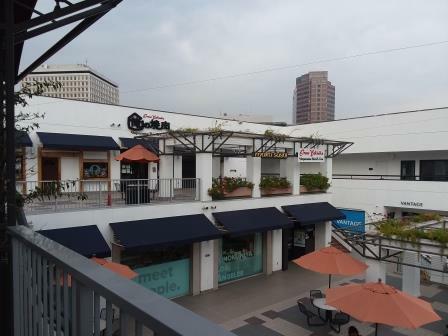 The first overseas location was in the Sawtelle District of West Los Angeles, which opened in January of 2017. The Little Tokyo location opened in March of 2018 after a strong determination of success was felt at the Sawtelle location. There have been Osaka style Okonomiyaki restaurants in the US; however, there was no place where you could eat Hiroshima style Okonomiyaki. What is the difference between the Osaka style and the Hiroshima style? As mentioned earlier, Hiroshima style has many layers. The Chinchikurin menu explains that in an easy-to-understand way with an illustration. First comes the dough, then fish powder, shredded cabbage, tenkasu (fried tempura batter crumbs), bean sprouts, pork belly slices, soba, eggs, sauce, and dried seaweed flakes are piled on top of each other, pressed down, and grilled, one by one in order. When you take a bite of a piping hot piece, it feels like those ingredients are trying to make an impression in your mouth with each of their tastes and textures. 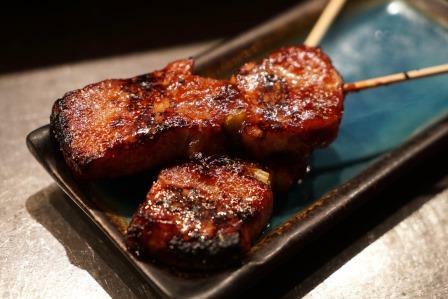 The most popular menu item is the Chinchikurin yaki ($17.00). It is a signature item in Japan, which is called “Shoburiyaki” in Japan. Boneless short rib of beef is used in Japan, but in the US, ground beef is used for easier acceptance by Americans. On the interview day, I tried the second most popular item, “The Loaded Kaisen ($18.50)”. In addition to the basic ingredients such as cabbage, soba, and eggs, it had plenty of seafood such as shrimp and sliced squid on top. It is a very satisfying and luxurious menu item both visually and volume wise. What is indispensable to complete the piece is Hiroshima’s Otafuku brand sauce. This sauce is produced locally at the Otafuku sauce factory in a Los Angeles suburb. Menu items such as Basil Cheese and Broccoli Shrimp Yaki are unique to the American market. There are 8 kinds in Okonomiyaki alone, and one for vegetarians has been added newly to respond to many requests from the Los Angeles area. There is no need to say that no meat is used for this piece, but even no eggs or fish powder are used. In addition to the Okonomiyaki menu, you can also order Hiroshima style tsukemen and soup-less tantanmen. They are planning to add more appetizers and desserts. Most of their customers are non-Japanese. What do they do to secure the number of customers? “We don’t use prints or other media advertisements much. As for the Little Tokyo location, the huge glass windows facing the street is the key, I think. It seems that people get curious watching people inside eating an unfamiliar-looking food in front of an iron grill. We also try to maintain a cheerful ambience of the restaurant at all times. We train our staff to serve customers cheerfully and as loudly as possible,” says the manager Sahara. As the result of such efforts, the restaurant has become so popular that on weekends, people wait in line in front of the restaurant. They sometimes serve as many as 500 people a day. The 3rd US location is being planned to open soon in Torrance (this information is as of December of 2018). Such a day may be near that you can eat Hiroshima style Okonomiyaki anywhere in the US. The 43rd edition of Japan Week (http://www.iffjapan.or.jp/) organized by the International Friendship Foundation, a non-profit based in Tokyo, was held in Torino, Italy. The welcome reception was held lavishly at the Foyer of Teatro Regio, attended by Japanese and Torino affiliates, totaling approximately 300 guests. Japanese guests dressed in kimonos, while Consul General Amamiya, the Consulate General of Japan in Milan, gave a congratulatory address. The Deputy Mayor and many participants also attended from the Torino side, and the Japanese and Italian attendees intermingled with one another. During the welcome reception, the “Awa sake” produced by a member sake brewery of both the Nanbubijin Awasake Sparkling and Japan Awasake Association were served to all participants as the welcome toast. Normally, champagne would be served, or Spumante this year, since the event was held in Italy. However, the Japan Awasake Association was behind the effort to serve Awa sake as the welcome toast at the official party!! This is a first, unprecedented feat worldwide! !